She had captured the moment perfectly. The instant was frozen with thin strands of coloured paper still hanging in the air amidst the faint smoke clouds created by tiny amounts of gunpowder. Below, sitting cross-legged on the wooden decking, her three-year-old nephew had his hands tightly clasped to his ears and his eyes screwed shut. His second cousins were leaping and grasping at the air above his head, trying to catch the raining confetti. Slightly apart, in her pretty yellow party dress, her niece stood with her arms outstretched, holding a large box decorated with patterned paper and a large bow. Bright, shiny banners and clusters of colourful balloons were strung overhead from the verandah roofing. Off to the right of the frame, a small huddle of people were gathered at the edge of the deck. They were viewed from the side but she could still clearly identify her older brother and heavily-pregnant sister-in-law, and her cousin in a loose-fitting singlet, proudly showing off his hard-earned muscles with his wife looking tiny next to him. Behind them, a silver flash of hair marked the imposing presence of her uncle. They all had champagne flutes or spent plastic party-poppers raised before them. Opposite, at the extreme left of the shot, her mother could be seen through the open ranch-sliders, still inside the dining room, her hand outstretched. She had just given her husband a gentle, reassuring nudge forwards and he now stood on the threshold between the house and the deck. The initial look of surprise and slight concern on his face had subsided. His wide eyes had narrowed and his gaping mouth had metamorphosed into one of his trademark grins: a web of wrinkles circling his eyes and a flash of perfectly aligned whitened teeth. In that fraction of a second, from her position in the yard, she had caught her smiling father facing the loving welcome of his family. Satisfied, Elle turned off the camera and walked back across the yard towards the house amidst the hubbub of excited chatter. She skirted the line of relatives waiting to pass on their congratulations and gifts to her father. Her Uncle Bill hung back at the far end of the deck and Elle went to join him, picking up a glass of champagne from the table on her way. ​”Thanks for coming over Uncle Bill. It’s really good to have you here.” She gently clinked her glass against the one in her uncle’s hand. ​”Well, your little brother only turns sixty once, doesn’t he?” her uncle replied with a thin smile. Elle didn’t really know Uncle Bill that well. He had moved to Australia before she was born and this was only his second trip back home in all those years. The last had been almost twenty years ago for his mother’s funeral, when Elle was only a little girl. She had visited him and her cousins a few times in Perth, mainly for family occasions like weddings, her aunt’s funeral and, a couple of years ago, to celebrate Uncle Bill’s retirement from the force. When she was a child, she’d found him intimidating, carrying a natural air of authority that was enough to keep the cousins all in line. Elle’s brother knew him better. He had gone over and joined his cousin working at the mines for a few years. His kids and their cousin’s children were similar ages and had spent a lot of time together too, and it was Elle who sometimes felt like a stranger in the family. She knew her uncle and father had had some falling out years ago that had never really been resolved and, despite repeated pleading, her father had never been to Perth. When she started organising the party, she had hoped that she could initiate a reconciliation between the two men. Her brother had called her an idealistic idiot; had told her she was just like dad. Her mother had been slightly more encouraging, quietly musing that, “perhaps the old bugger’s softening with age.” Elle wasn’t sure which of the men her mother was referring to, but assumed it was Uncle Bill. She’d always thought of her father as easy-going and quick to laughter, and couldn’t imagine him being capable of holding a grudge. But Elle had had to make a lot of assumptions. As the youngest, she always felt that certain things were obscured from her, no doubt on some pretext of protecting her, but she was sick of being treated like a child. She’d decided she was going to invite Uncle Bill and show them that whatever had happened could be left in the past. The crowd of well-wishers surrounding her father subsided as the children went off to play and the adults to top up empty glasses. ​”We should say ‘Happy Birthday’,” Elle said, glancing at her uncle before crossing the deck to where her father stood. As she approached him, he stepped forwards and placed his hands firmly on her shoulders, looking at her sternly. ​”Well, I hear this was all your doing,” her father said gruffly but with a smile emerging in his eyes. He pulled Elle in and kissed her on the cheek before wrapping her in his arms for a vice-like hug. Her father had always been a strong man, playing for the first fifteen at high school, kept fit by his years working as a landscape gardener and still active with fishing and golf. She could barely believe that he was actually turning sixty. “And I see you managed to persuade your Uncle Bill to cross the ditch,” he whispered to her as her head rested on his shoulder. ​”You’re not angry, are you dad?” she asked without breaking their embrace. The afternoon was filled with the squeals of the children around the paddling pool in the yard, the hum of conversation broken by regular peels of laughter, the clatter as another empty bottle was dropped into the recycling crate. Sausages and steaks sizzled on the barbecue, regularly turned by either her brother or her cousin, while the kitchen was crammed with women filling bowls with pasta salad, potato salad and Greek salad, or slicing loaves of bread, warm from the oven. ​”Do you think we’ve got enough food?” Elle’s mother asked anxiously, as she balanced serving tongs on each of the overflowing bowls. Elle just smiled at her. Her mother always over-catered and they both knew that they would spend the next two days trying to make inroads into leftovers. And sure enough, less than an hour later, everyone was moaning and complaining of having over-eaten. ​”Not too full for cake I hope,” Elle’s mother announced brightly as she emerged onto the deck, proudly carrying the cake she had baked and decorated, the air around it hazy from the glow of candles. The family erupted into a discordant version of ‘Happy Birthday’ as she placed it on the table in front of her husband. Elle snapped off some shots as her father took a large gulp of air and extinguished all the tiny flames, his eyes clenched closed in a secret wish. ​”I’m not one for big speeches,” he started, accompanied by the groans of those who knew this to be not exactly true, before going on at length to thank Elle and his wife for organising the surprise and everyone else for attending. “It’s lovely to have the family together.” He paused. “It’s even nice to have Bill here,” he finished, smiling wryly and raising his beer bottle in a toast towards his brother. The sky darkened and the air filled with the scent of citrus candles. Voices grew louder, drowning out the sound of the television emanating from the lounge, where the children had decamped after their afternoon exertions and were slumped on a collection of cushions. In the usual manner, which still surprised and jarred with Elle, the women had gravitated towards one end of the table and were sharing recipe ideas, while at the other end the men were speculating on which rugby teams would be successful this season. Listening in, Elle was surprised that her father was contributing very little to the discussion, a subject on which he was usually voluble. He was seated pensively at the head of the table, allowing all the talk to wash over him, taking regular sips from a large glass of his favourite single malt. All conversation was then momentarily disturbed by the rumbling avalanche of bottles onto the wooden decking when her brother tried to balance another on top of the precarious mound already in the crate. Eventually, the chilly evening air of the end of summer started to bite and forced everyone to retreat indoors to the open-plan kitchen-living-dining space. The children were all now asleep on their mound of cushions, oblivious to the chatter all around them. Elle was in the kitchen, helping her mother load plates, dripping with salad-dressing and meaty juice, into the dishwasher. Raised voices over the steady buzz of conversation made both the women look up from their task. Her father had pushed himself up from his armchair and was standing, swaying slightly, glaring at Uncle Bill. ​”You were just a government lackey, helping them support a fascist, racist regime. Where were your principles?” Her father was yelling at him, his face flushed, drops of spittle projected in front of him. Uncle Bill remained seated. ​”I was doing my job, George. You’ve never understood that” he said calmly. Her father launched the half-full beer bottle in his hand across the room. It smashed into fragments as it impacted on the wall just above Uncle Bill’s head, knocking the framed photograph of Elle’s brother’s wedding to the floor. Nobody moved. There was a moment of absolute silence before her nephew began to wail, frightened out of his slumber. Then her uncle wiped the splashes of sticky liquid from his face before concentratedly standing up and striding to the hall. Still no-one spoke and they all started slightly as the front door slammed behind him. Elle turned to the window and watched her uncle climb into the front passenger seat of the hire car parked in the driveway. He stared straight ahead of himself, motionless. She turned back again just in time to see her father take the opposite direction down the hallway, the slam of the bedroom door behind him marking his exit. Frozen, she watched as her mother crossed the lounge and retrieved the fallen photograph, carefully repositioning it on the wall. Then she stooped to pick up the pieces of broken bottle from the carpet. Elle’s cousin’s wife was the first to speak. ​”Here, let me do that,” she offered. ​”No, no, that’s okay. You should go and see if Bill’s alright,” Elle’s mother said, only the slightest of a quiver in her voice. ​”Well then,” she hesitated and looked over at her husband who was already corralling their two boys towards the door, “Thanks so much for the meal. It was really nice to see you all.” The front door opened again and from the window Elle watched as the children were manoeuvred into their car seats while her cousin got into the driver’s seat. He said something to his father but the older man showed no sign of having heard, his face still stone. ​”I think we’d best be getting off too mum.” Elle’s brother was the next to flee the scene. His mother was still hunched over the puddle of beer, trying to soak it up with a cloth, as he kissed her on the top of her head. “See you next week.” He walked past Elle on the way to the hall where his wife and children had hastily assembled. “See you soon sis. Thanks for a great party,” he sneered. Elle put down the dirty plate she was still holding in her hands and started to sob. Her mother tipped the pieces of green glass into a newspaper that was lying next to the woodburner, wrapped it up and came over and placed it on the kitchen bench before putting her arm around Elle’s shoulders. ​”Why do they hate each other so much?” Elle sniffled through her tears. Without speaking, her mother went out into the hallway and Elle heard her rummaging around in the cupboard. She came back with an old spiral-bound scrapbook, its paper pages curled at the edges and its cover stained with what looked like a circle of coffee. She placed it on the kitchen bench before them. As her mother flicked through the pages, gently prying apart those that had become stuck together, Elle saw the yellowing news cuttings that her mother had labouriously collected and preserved. There were flashes of headlines from before she was born, over thirty years earlier. ‘Smoke Bombs, Mass Arrests’, ‘Epic Battles Off-field’, ‘It was as if the sun had come out’. Pages held hand-drawn flyers: ‘Mobilise’, ‘Rally against the tour’, ‘Boycott the Blood of Apartheid’. She saw blurry photographs: a light plane flying low over a stadium; barbed-wire surrounding a sports ground; a group of civilians sitting on a rugby pitch encircled by police, separating them from an angry, jeering crowd. And then her mother stopped at another, larger black and white photograph, given a page of its own at the back of the scrapbook. The right hand side of the shot was dominated by police officers in shiny black helmets, their vizors reflecting the light and obscuring their faces. On a wintry September day, they stood in a regimented line of replicas, their black greatcoats covering all distinguishing marks and features. The front row of men were poised, batons held in hand at their hips. Facing them, on the left of the shot, was a more ramshackle group of men dressed in sweaters, jeans and their own protective headgear. These were a miscellany of cycling helmets, motorbike headwear and hard hats, with faces hidden behind vizors, hockey masks, goggles and bandanas. 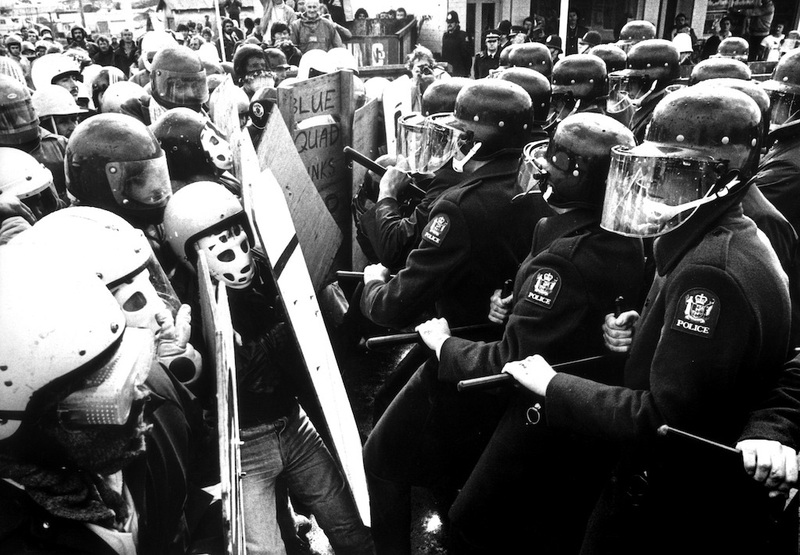 Makeshift shields made out of plywood panels were the only thing separating the two antagonistic sides of this face-off. ​”That’s your father,” her mother said, pointing towards one of the foremost men in a motorcycle helmet, holding the thin wooden protection before him. “And that’s your Uncle Bill,” indicating the police officer directly opposite her father. Elle stared, trying to peer through the reflective glass to gain a hint of recognition of either of the men, sensing the electric tension in the distance between them.